Brilliant Classics presents exhilarating music from Holland’s Golden Age, virtuosic works for solo recorder. Jacob van Eyck was a contemporary of Rembrandt. Unlike the famous painter he resided in Utrecht, a city of many churches in the centre of The Netherlands. At the time, the blind composer and city carillonneur was well-known for his improvised virtuoso recorder playing and as such was quite an unusual phenomenon. Even now, some three and a half centuries later, one can sense the breathtaking qualities of his music, ‘The flute’s garden of delight’. This collection of Dutch music consists of a variety of pieces, mainly a series of variations on psalms and popular songs: almost 150 in all. 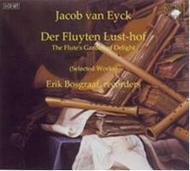 On 3 CDs, the young Dutch recorder player Erik Bosgraaf tackles a selection of 65 works from Van Eyck’s opus. Playing on copies of period instruments, he treats this music in an improvisatory fashion.